In addition to the population of subject and visit records, the benefits of EDC integration also include Dashboard and Analytics (e.g. Target vs. Actual Recruitment Curve), oversight of enrollment by cohort and/or protocol version, management of subject payments, and tracking of subject progress within Electronic Visit Reports (EVRs). For example, having near real-time screening, enrollment and visit data populated in the CTMS will build out a Recruitment Graph where target vs. actual screening and enrollment can be compared over time. Subject visit data can automatically trigger subject payments to be flagged for invoicing and/or payment. Also, screening and enrollment data can be utilized in electronic visit reports, allowing streamlined tracking of subject activities monitored at the visit (e.g. consents and deviations) and related action items. This EDC integration support for SimpleTrials builds on several years of integration experience from the team at Trial By Fire Solutions with over a dozen EDC systems. Trial By Fire Solutions focuses on designing and supporting outstanding CTMS products, and therefore we realize how critical it is for our products to integration well with other types of clinical systems. Further, the development of EDC integration capabilities was driven largely by our customer feedback loop. As the SimpleTrials customer base has grown, and more studies have started screening and enrolling, many of our customers have requested EDC integration with SimpleTrials. Given the customer demand, we leveraged our integration experience to develop and release EDC integration capability for SimpleTrials within a few months. SimpleTrials is the only on-demand, subscription based CTMS to offer full transparency to our customers. Pricing and subscription plans are detailed on the website (starting at $99/month for small teams), license agreements are available for download and review, and there are no startup fees or multi-year commitments. We wanted SimpleTrials to follow that same on-demand model for EDC integration, so customers can use the study profile module in SimpleTrials to setup the EDC integration, and control when it goes live. The support team at Trial By Fire Solutions is always happy to help, but we are finding that customers appreciate the "plug-n-play" approach that gives them control over the integration for their studies. EDC integration capability is now available to all SimpleTrials subscribers, and the supported systems are based on customer request. If you are an existing or prospective customer for SimpleTrials, please contact us and let us know what system you use, and we are happy to further discuss how integration can benefit your studies. 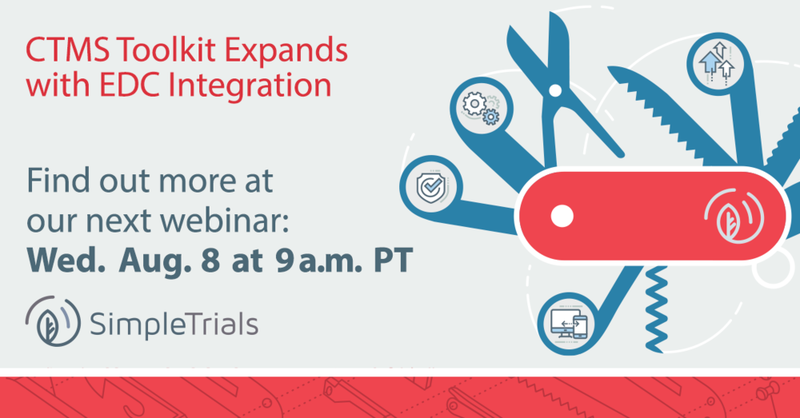 If you are interested in seeing a live demo of SimpleTrials, please join us for an upcoming webinar. You can also give SimpleTrials a test drive, with no long term contracts and the ability to cancel anytime, for just $35/month. That Trial plan gives you full access to all features in SimpleTrials, as well as a Sandbox study pre-populated with demo study data.